The big technology company&spamp;rsquo;s efforts to educate its top finance talent are marked by a mix of virtual and face-to-face elements, which is a sensible if not-too-common approach. Most Fortune 100 companies have substantial formal programs for educating their top finance talent, and Dell is no exception. But the technology giant may have a slight edge, thanks in part to its use of a simple tactic that is nonetheless uncommon for such programs. Almost all companies Dell’s size are globalized, and most try to homogenize their programs as much as possible. In general, the education is delivered either virtually or in classrooms to teams scattered around the world. Dell, though, is using a combination of those tactics. For the third and fourth semesters of the company’s key Financial Development Program — a two-year curriculum for high-potential recent college graduates and undergraduate interns ­— teams work virtually for several weeks and then convene for a week in Austin, Texas, where Dell is based. “I don’t know of another company that combines the two approaches,” says Tom Conine, founder of TRICorporation, which provides design, development, and implementation services for large companies’ financial-education programs. Its clients include Dell, Microsoft, General Electric, and Stanley Black & Decker. The combination makes a difference not so much from a finance perspective as from a team perspective. 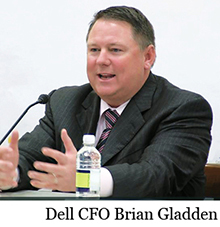 “Going forward, decision-makers have to be able to work both virtually and face-to-face, and the team dynamics of the two are very different,” says Conine, who credits the idea to Dell CFO Brian Gladden and Alicia Davis, the company’s director of global finance learning and development. Dell’s programs are geared toward finance professionals with different levels of experience. In addition to the Financial Development Program, or FDP, there is the Financial Rotation Program (FRP), for top talent with 5 to 7 years’ experience, and the Global Financial Excellence Program (GFEP), generally for those with 10 to 12 years’ experience who have just gotten or are about to get their first executive appointments. The educational effort began in 2009, though in Dell’s culture the programs are still considered new. “These are contemporary programs that deal with the realities of today,” says Gladden. To that end, they feature simulations where participants are grouped into teams that make business decisions for hypothetical modern companies. The simulations, which feed the participants information that they factor into their decisions, increase in complexity from one educational-program level to the next. “Simulations are effective because you learn by doing,” says Conine. “When you do that, you make mistakes that you learn a lot from. The simulations are also competitive, and most financial people thrive around that.” And participants get to make decisions relative to the entire business, about pricing, production, cost, new products, market direction, and more. The simulations force participants to work under four different types of stress. They have to perform while dealing with time pressure, limited information, scarce resources, and divergent opinions on the team. “When you mix those elements together, it makes for real-world decision-making under conditions of uncertainty,” says Conine. The simulator runs the various decisions made through an econometric model and spits out hard-number results. Simulations are a feature of all three educational tiers. The entry-level program, the FDP, covers two years. There are about 50 new participants each year, so that at any one time about 100 people are included. In addition to the simulations, the program calls for them to rotate among roles that include segment and opex analysis, intercompany accounting, cash-management analysis, pricing, corporate planning, competitive analysis, financial services, credit analysis, external reporting, budgeting and forecasting, and logistics. Some FDP graduates branch off to either internal audit or various finance roles. Within three years, they are eligible for consideration in the FRP. That lasts for three years, with participants given three different one-year assignments. Many of those are outside a person’s home country. Roles include investor relations; assistant controllership; procurement (where a person would be an analyst for a commodity buyer); opex roles such as supporting the marketing budget; financial planning and analysis; treasury; foreign exchange; and cash management. There is also a tax role, which Davis calls “relatively unique to our rotation, to understand not necessarily how to do an accrual but how value-added tax or transfer pricing works.” Participants don’t necessarily choose which assignments they get, she adds, but they can express preference. At the third level, the GFEP, participants go into the field, doing benchmark work at other companies where they work with the CFO and finance staff to understand the issues they are dealing with that relate to Dell. Those companies, which are selected based on their reputation for maintaining best practices, also send their people to Dell for similar learning. The GFEP participants also work on a big team project that is reported to Dell chairman and CEO Michael Dell. Last year’s project was around what Dell calls “purpose-driven companies,” or those that execute against strategies that are clear, concise, and branded. Key learnings included how every team member “lives the brand” at Coca-Cola, the business-integration processes at Stanley Works, and executive involvement in recruiting at Goldman Sachs. Meanwhile, Dell is developing a program to provide financial education to certain nonfinancial employee groups. People from marketing, sales, research and development, and information technology will take four modules built around the income statement, the balance sheet, factors affecting profitability, and key financial ratios. As a result of the programs, the company also is now more consistently focused on a core set of operational financial tools. “A good example is income variance, driving a consistent set of tools across the company to measure the results of our business units,” says Gladden.